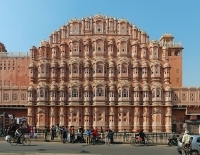 The Palace of the Winds is Jaipur's most acclaimed attraction. Built in 1799, it is situated on the edge of the City Palace complex overlooking one of the city's bustling main streets, and was constructed to offer the women of the court a vantage point, behind stone-carved screens, from which to watch the activity in the bazaars below. The five-storey building is shaped like a crown adorning Lord Krishna's head, and contains over five hundred finely-screened windows and balconies. Although the palace's primary appeal is its ornate and finely-carved pink façade, visitors can also go inside and see the intricate, honeycombed stonework of the original screens close up. There are beautiful views of the city and some surrounding forts from the inside of the building. Additional motivation for exploring the interior - apart from the thrill of imagining the royal wives and consorts flitting about behind their screens - is the naturally cool, breezy nature of the place, which makes it refreshing on hot days. Those who just want to see the building and take some photos can do so from the road without paying the entrance fee. The building is particularly lovely early in the morning when the light makes it seem even pinker than usual.